Home News General: U.S. troops needed in Iraq? General: U.S. troops needed in Iraq? If Iraqi forces aren’t making good progress against Islamic State militants in the next several months, the U.S. should consider embedding American troops with the Iraqis, the Army’s retiring top general said Wednesday. 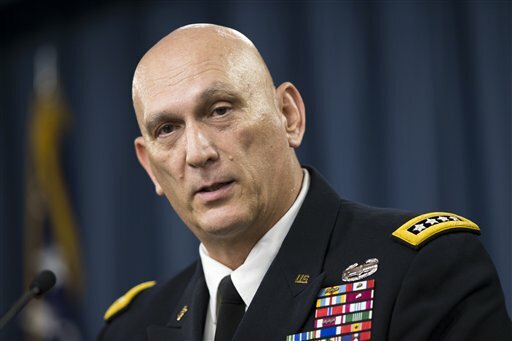 Gen. Raymond Odierno, who retires as Army chief of staff on Friday, said the U.S. forces would not be directly involved in the fight. Speaking during his final Pentagon press conference, Odierno hit a broad range of topics, and spoke at length about Iraq and his frustrations as a commander who spent three long tours there only to see the country plunge again into chaos. He discounted suggestions — including by Republican presidential contender Donald Trump — that the U.S. should take more aggressive military action in Iraq, saying the solution lies with political and economic reforms. He said the U.S. could probably go into Iraq with enough force to defeat the Islamic State, but the success would not last. Odierno is stepping down and will retire on Friday after 39 years in the military and four years at the U.S. Military Academy at West Point. His service has been punctuated by three tours in Iraq that included leading the 4th Infantry Division during the 2003 invasion and serving as the top military commander in the country from 2008-2010. “It is frustrating to look at what has happened inside of Iraq,” said Odierno, recalling that in 2010 and 2011, the U.S. “thought we had it in a place that was really headed in the right direction.” He said violence was down, the economy was growing and the political situation was stable. And that, he said, allowed Islamic State militants to exploit the fissures and find open territory in Syria to begin to grow their forces and build their capabilities. In other comments, he called Russia the most dangerous military threat to the U.S. right now, because Moscow is “more mature” than many other U.S. adversaries and has shown significant, sophisticated capabilities in its invasion of Ukraine. He said the Army has been working to rebuild its ability to fight an adversary like Russia over the past 18 months, mainly training for hybrid warfare, which includes a mix of conventional, counterinsurgency, cyber, space and other military capabilities. This is how Vietnam started, that slippery slop is here. If we are to send troops to fight along side of Iraq then send the troops. We do not need another Vietnam, if we are going to fight ISIS/ISIL/Daesh then send the Divisions with heavy support and turn loose the SpecOps guys. Conduct it as a war not a f***ing. bleeding, moral, force destroying, draining, no end in sight, no clear purpose, cancerous police action. Don’t try to pacify the enemy, destroy the enemy.